Oxfam report sheds light on ineffectiveness of tax policies across Latin America and the Caribbean, which play a part in consolidating the region’s high levels of social and economic inequality. Inefficient tax collection, including revenue lost to tax evasion, is hampering Latin America’s fight against inequality, according to a new Oxfam report. Image via Wikimedia Commons. The international development organisation Oxfam has published a damning new report on the inefficiency of tax regimes in Latin America, claiming that they are a major reason why the region remains the most unequal in the world despite a recent decade of excellent economic growth and poverty reduction. The report, Fiscal Justice to Reduce Inequality in Latin America and the Caribbean, draws comparisons between the region’s low tax collection levels and its “great social needs”, and calls on governments of Latin America and the Caribbean to implement “courageous” fiscal reforms that would “benefit all citizens and not only economic and political elites”. Oxfam criticises the lack of political will by governments across Latin America to properly address their countries’ social needs by raising tax revenue, which the NGO argues should be done by increasing the tax burden on the wealthier sections of society. Political and economic elites have shaped tax regimes to their own liking, according to Oxfam, which has left them with “very limited effectiveness” when it comes to trying to overturn the region’s historic inequality levels, or indeed has led to these inequalities actually deepening. “Poverty and inequality are not inevitable and do not drop out of the sky”, Oxfam’s Inequality Campaign Coordinator for Latin America and the Caribbean, Rosa Cañete Alonso, said in a press release on the organisation’s website. “The tax system design is a reflection of the political will of government officials to achieve a more equitable society or at least one with less inequality. Our analysis of the tax systems in the region shows that they are shaped to benefit economic and political elites and not the majority of the population”. 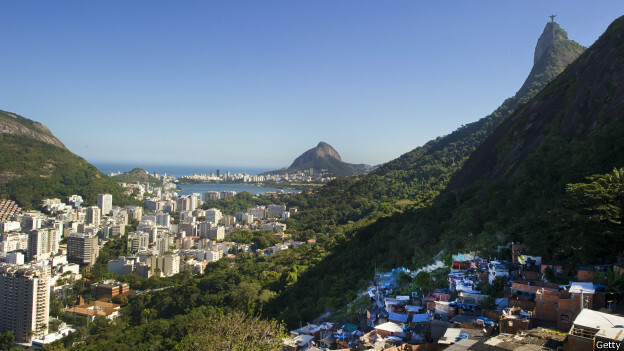 Rio de Janeiro provides some of the most obvious symbols of inequality and lack of social cohesion within a single city. Photo courtesy of Getty Images via the BBC. 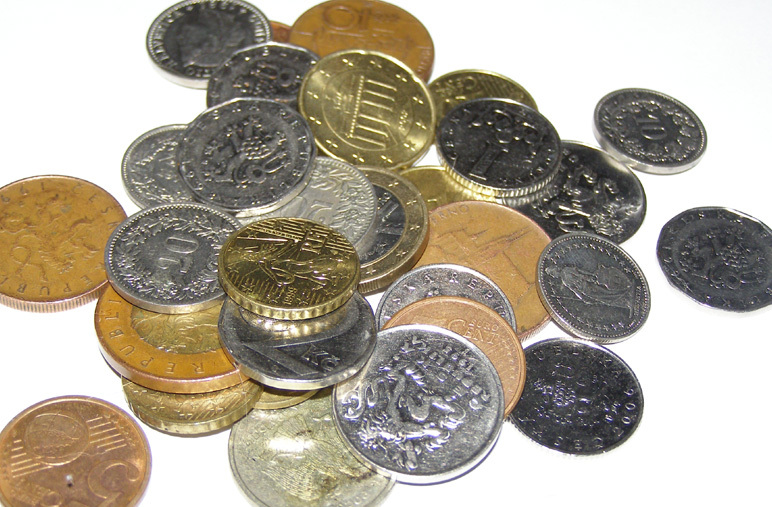 The report argues that fiscal policy is “a state’s primary tool to fight against inequality” by using extra revenue to fund well-directed public spending and social programmes. However, Latin America is “underuses fiscal policy as a development tool”, with public finances across the region generally “fragile”. Meanwhile, since income and wealth taxes yield less than they should do, governments are overly reliant on consumption taxes – such as VAT – which end up affecting poor people the most as they spend a far greater proportion of their disposable income on food, fuels and essentials. Additionally, Oxfam criticises the extent to which tax evasion is still rife, with companies reportedly having levels of tax evasion that range from 46% in Mexico to 65% in Ecuador, “without adequate sanctions for tax evaders”. This is blamed on weak institutions, with a lack of “internal control mechanisms of the tax administration system” leaving multinational companies free to make the most of tax havens and other loopholes in international tax regulations. There is an argument that tax evasion is depriving governments of vital revenue for public spending, to the extent that they are more likely to be forced to press ahead with major mining and development projects that highly unpopular due to their damaging social and environmental side-effects. This is particularly pertinent in a continent whose economies are still highly dependent on exports of hydrocarbons and raw materials, yet the foreign companies who exploit their mineral and natural resources are often awarded generous tax breaks, the report points out. This dependency that many Latin American economies still have on the exportation of primary materials is highlighted as another failing in the region’s fiscal systems, given that this economic model often comes at the expense of developing other aspects of the economy, which would help generate upward social mobility and “improve the working and living conditions of many poor workers”. Another aspect mentioned is the way that fiscal policy often “reproduces traditional views of the role of women in society”, given a lack of consideration of women’s “different consumption patterns, their economic activities, or their role of ‘caregivers’ that society has credited them with by default”. This means that tax policy can end up being “more regressive, costly and inefficient for women than for men”. 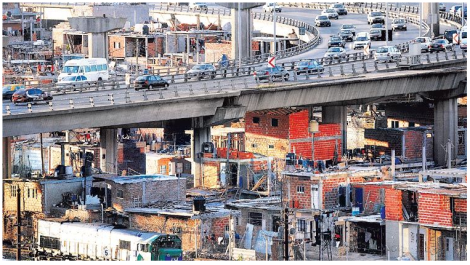 Slums in Buenos Aires. Despite being one of the richest countries in Latin America, and the one with the 2nd highest Human Development Index (HDI) rating, Argentina is still home to considerable inequality. Photo via MercoPress. Oxfam argues that the fact that public spending has increased in recent times – in line with the strong economic growth that almost all countries have enjoyed since the turn of the century – but has not altered the landscape of extreme inequality across the region, is “indicative of the need for a more transformative approach to public policy, and especially fiscal policy”. Among the recommendations that the report makes in order to encourage a fairer and more equitable tax system that would lead to more “cohesive” societies, the need to reinforce tax regimes as “the instruments of redistribution of wealth” is highlighted, with an emphasis on “[exerting] more pressure on those who have more, to contribute more”. Also included is a plea for tax evasion and avoidance – by individuals and companies alike – to be brought under control, with zero tolerance on tax fraud and “an end to the lack of transparency of tax havens” urged. Additionally, there should be more incentives for informal employment to be formalised, so that companies and working poor people who are currently “invisible to the state” can be included in the tax system. However, the report states that “while it is essential that the majority of citizens and economic sectors are taxed, it is also necessary that this is done in a manner consistent with their ability to pay”. Formalisation of the workforce would have the additional benefit of increasing job security for the millions of Latin Americans who are currently ‘trapped’ in informal and precarious work, which can leave them outside the sphere of health and social insurance.